This is just a quick post to share an accidental dish I’ve been eating over the last week as a side to everything. On my first visit to the Cruelty Free Shop, I bought some Half Pint Dairy Vegan butter (along with a lot of other things!). This was probably a mistake as I love it and have been eating it on lots of things. I had not been eating margarine for several months since I decided it was pretty disgusting. Perhaps it would have been better had I remained blissfully ignorant of its existence! 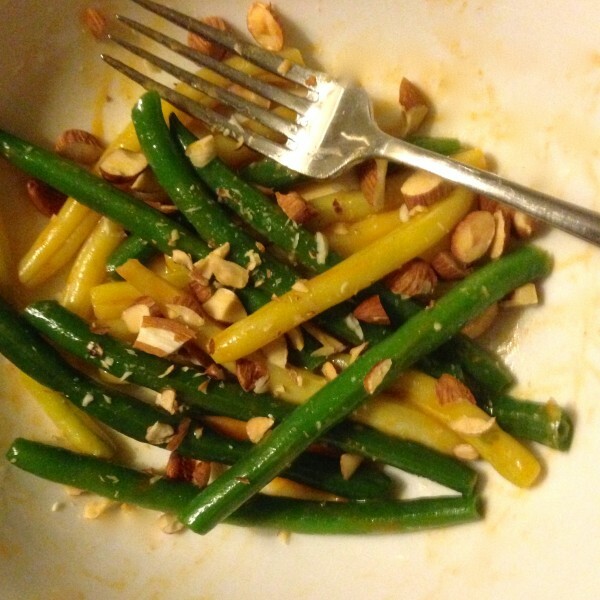 Anyone who grew up with Women’s Weekly Cookbooks will remember green beans with butter and almonds. We thought we were so sophisticated eating them. But really they are delicious even if a bit dated. I decided to make some with the butter and almonds, but I thought they needed something to perk them up slightly. These look super simple and delicious – what does the Half Pint butter taste like in comparison to, say, Nuttelex or margarine in general? I hated butter growing up so I’m not sure whether I should give it a go or not – but it’s tempting. I was a butter lover, I like Half Pint much better than Nuttelex. It doesn’t necessarily taste like butter, but has none of the margarine flavour. It is the creamy texture that it gives that I really like. Consider me sold on this flavour combination. Rich, fragrant, spicy… what’s not to love!